Coasters don’t have to be complicated to look good! After all they’re just circles you put your drinks on so that you don’t mess up your table. 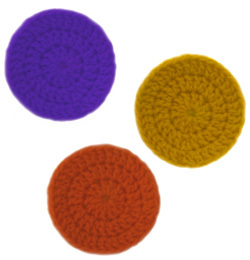 In this crochet pattern, there isn’t anything complicated or fancy, just the easiest coaster pattern you will ever come across. Gauge: rounds 1 – 3 in pattern measure 3 1/2″ in diameter. 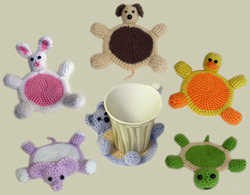 You may also like to check out the Crochet Pattern: Amigurumi Animal Coasters for the cutest coasters ever! If you need help crocheting your coaster, no worries! Just leave a comment and I’ll be sure to help! This entry was posted on Tuesday, November 10th, 2009 at 7:27 PM by Rachel Choi	and is filed under Free Crochet Patterns. You can follow any responses to this entry through the RSS 2.0 feed. You can leave a response, or trackback from your own site. This is a great pattern for those teaching others to crochet! It is also a great pattern for parties because you can crochet different colors so each person can have a different color to remember whose drink is whose. Plus they work up fast! If someone would want to get “fancy” they can put a border around the edge! HEY LADY,DO YOU HAVE ANY HATS WITH EARLAPS PETTERNS? Those are THE most perfect stitches in the round that I have ever seen. It takes skill to get them to look all the same. And I am not there yet. But working on it, to be consistent. Great job!! This is fabulous practice and inspiration, your stitches are so perfect! Thanks tons, I’ll be linking. I have made several of these now and I can’t get the hole in the middle to close. Any thoughts? Also, if I wanted to add another row to make it bigger, would I just do 2 dc, 1 dc like with the 3rd row? I don’t understand where the 12 dc go and if they are all in the place and are the “half dc” or do they build on each other or do I put 3 in one hole 3 in the next till I have 12 or what? Jessie, you make all 12 double crochets into the forth ch from your hook. So each time you make a double crochet, you are going to insert your hook into the same chain, until you have 12 double crochets. This will create a small circle. There are no half double crochets in this pattern. Does the ch 3 count as a dc? Would the first round consist of 11 dc plus the chain 3 or 12 dc plus the ch 3? And the same with round 2 and 3: 23 dc plus ch 3 or 24 dc plus ch 3; 35 dc plus ch 3 or 36 dc plus ch 3? Hi Kari Jo, when a pattern tells you to count the ch 3 as a double crochet and there are suppose to be a total of 12 dc, there would actually be 11 dc plus the one ch-3. However, in this pattern, it does not tell you to count the ch-3 as a double crochet. Rachel, thanks for this idea on how to weave in ends easily. This has always been my LEAST favorite task while crocheting. I will use this in my work now. Thanks! oops, sorry I meant to post this in another section about weaving ends and thought I was there when I posted. Sorry. Without it falling into a spiral effect, the first 3 ch seems to “lie”down and “slop” and theres my gap!! I hope you understand what I’m trying to say. Hi Aqua, if there’s a gap then it is possible that you are missing a dc on that round or the stitches are offset. Make sure that the first dc you made is actually in a dc not in the sl st, and count the stitches just to be sure that they are all there. Thank you, I’m sure I’ll get the hang of it with practice….1 more thing, whats up with the curling inwards bowl shape?…. It’s not suppose to curl inwards, it should lay flat as a circle. If it curls in you may be missing stitches, making a round tighter than it should be. Hey Rachel! Super easy pattern, thanks for sharing! I posted my results and a link to this page on my blog in case you’d like to take a peek. I love these coasters. I make sure the “body part is the size of a CD. I make two. For ex., for the bear, I made the back side of it completely blue. Stitched the two together (with CD inside) and finished off with legs and head as directed. It sturdier, but unfortunately it wouldn’t be washable. I’m going to be teaching my little granddaughters… I think this may be a possibility in a month or so… Thanks for all the free patterns!!! Love ALL your patterns, just very limited $$$. I don’t understand, if I do 12 dc in 4th chain from hook…are you saying go back and do sl st in the 3rd ch from hook??? and where do you do the next 12 dc after the : or are you stating the total dc for the round? Really a beginner here, please excuse the ignorance. Hi Sharron, the number after the colon is the stitch count for the round. It is there so you can double check your work. At the end of the round you will make a slip stitch into the third chain that you made at the beginning of the round. It is on top of the other chains that you made. I think I have fallen in love with this pattern. I searched high and low for a workable and easy enough pattern I could work up quickly and with very little yarn. I am a total beginner so I can do the basics and every where I looked I just couldn’t make out what the pattern was saying so I thank you from the bottom of my heart that you posted this. Mins so that’s a major plus. Definitely sharing this with my friends! One question though , if my stitches are a little bit looser than normal people’s could I go a hook size lower and still come out with the same result? I’m so glad that you like this pattern! Yes, you can use a smaller hook size. You can tell that you are crocheting with the same tension as the designer by checking your gauge. If the gauge is the same size then your tension matches the designer’s tension. You can change your hook as needed. Have fun crocheting! please tell us again how to weave in crocheted ends, please. what is medium weight yarn? Would it be 4 ply acrylic yarn?